Foreign species hitchhiked across the Pacific on debris from the 2011 Japanese tsunami—now researchers along the North American coast are scrambling to detect them before they take hold. John Chapman eyes the 15-cubic-meter steel dumpster brimming with beach debris collected along Washington State’s Long Beach Peninsula, near the Oregon border. Much of the dumpster’s contents is ordinary garbage: diapers, rope, boards, crab buoys, bottles, plastics, and fireworks with whimsical names such as Blond Joke and Honey Badger Don’t Care. Within this final excrement of a western society lies the scientific equivalent of buried treasure—pieces of debris that can be traced to the Japanese tsunami of March 11, 2011. “Today is a good day to dive,” says the affable marine biologist, wading in with rubber boots. There was a time when Godzilla represented the only unfamiliar Japanese creature to be released upon an unsuspecting North America. Today, all manner of real-life alien invaders may be floating just offshore. The Japanese Ministry of Environment estimates that 4.8 million tonnes of tsunami debris washed into the North Pacific; 68 percent sank and 32 percent remained adrift. The last thing Chapman expected was that non-native species might hitchhike their way to the western shores of North America. Then, in June 2012, a 188-tonne, 20-meter-long, floating concrete dock traced to the Japanese port city of Misawa washed ashore at Agate Beach, draped in at least 165 living species. The site is only five kilometers from Chapman’s Hatfield Marine Science Center office in Newport. The arrival of a Japanese Noah’s ark—a thriving ecosystem up to 20 centimeters thick—triggered a sea change in scientific understanding of aquatic invasive species. “I was not just wrong, I was spectacularly wrong,” Chapman says. “I was in shock, so convinced that couldn’t happen.” He confronts his fallacy every day—a portion of the dock sits outside the marine science center as a monument to the 9.0 earthquake and tsunami that officially killed 15,893 persons, injured 6,152, and left 2,567 missing. As the five-year anniversary of the tsunami nears, an international network of scientists is busy identifying species that have arrived aboard the debris and hunting the North American coastline, from Alaska to California and Hawaii, for others that may colonize and wreak havoc. The researchers have already found about 70 species of seaweeds and 240 species of invertebrates and microorganisms living on debris, primarily along Washington and Oregon where most of the work is concentrated. Some of the species are known only from Asia, especially Japan; some naturally occur on both sides of the Pacific; some were previously introduced to North America; some are non-native to Japan; others require more study. Scientists appreciate that even one invader has the potential to cause serious environmental and economic harm. Yet history also shows that most exotics coexist with native species without becoming pests, at least in the short term. Identifying potential insurgents is the daunting challenge, given the continent’s vast, corrugated coastline and the certainty of more debris yet to come. Gathered within a chain-link compound on the Long Beach Peninsula, our small but dedicated crew this morning includes Chapman, his lab technician Marie Barton, and local volunteer Russ Lewis. The moment I cross the line from objective journalist taking notes and photographs to helping out with moving some of the heavier piles of rope, there is no going back. “I locked the gate,” Lewis deadpans. He is a retired federal worker with the US Forest Service and Bureau of Land Management who spends up to three hours a day combing the shoreline for debris. During his forays, Lewis found a sign and a tote with identifying marks traced to companies in heavily hit Otsuchi. He was reimbursed US $72 in postage for returning the items to the city, where they became part of a tsunami memorial. One of his more unsettling finds was a female mannequin head carrying the inscription Tokyo Charm. “She looked a little bedraggled after 15 months at sea—gooseneck barnacles and fuzzy hydroids attached.” Lewis also found a grammar-school toothbrush kit and three slippers—the sort of items that personalize the human horror of the tsunami. This particular dumpster includes beach debris found by Lewis and a handful of other volunteers along an 11-kilometer stretch of beach from May through September. “We’re gonna be digging deep today,” says Lewis, sizing up the task. Much of the investigative digging actually takes place on the continent’s Atlantic coast, in the lab of Jim Carlton, professor emeritus of marine sciences with Williams College in Mystic, Connecticut. With the help of two part-time assistants—and participation from individuals, groups, researchers, and Canadian and US government agencies—Carlton has so far recorded about 400 tsunami-debris items bearing Japanese species. Carlton and his team sort the specimens by general scientific name—polychaetes, amphipods, bivalve mollusks, sponges, bryozoans, and so on. Then they begin the often-arduous process of species identification. Almost everything goes under the microscope, even mussels several centimeters in length as well as the creepy stuff growing on them. Carlton picks through a large library of scientific literature, enlists the help of an international network of taxonomists in the United States, Canada, Japan, and Australia, and sometimes requests genetic tests. The results give researchers and ocean managers all along the coast an idea of what they’re up against. The Japanese government in 2012 contributed $5-million toward cleanup in the United States and $1-million in Canada. In 2014, Japan made a further commitment of more than $1-million annually for three years to the North Pacific Marine Science Organization. The international group parcels out the money, in part, based on research proposals addressing invasive species. The cash is paying for Carlton’s research and for the collection of 3,397 “super sacks” full of debris—oversized plastic bags retrieved mostly from remote Alaskan coastlines by helicopters and from Ucluelet, British Columbia. In November, over 600 volunteers are expected to assemble in Seattle to sort the debris, which was gathered over the past two years and shipped south aboard a barge the size of a football field. The items, already pre-tested for invasives, will get sorted into piles of recyclables and non-recyclables, and personal items will be returned to owners as possible. Although researchers don’t agree on how much debris has arrived and where, each has a theory. Tom Therriault, a scientist with Fisheries and Oceans Canada, senses that most landed south of the Canadian border and draws a bullseye around Oregon and southern Washington. Yet some of the more dramatic pieces of tsunami debris have fetched up along British Columbia’s coastline, which stretches 37,000 kilometers and is largely accessible only by boat. Perhaps most remarkable was a Harley-Davidson motorcycle that came ashore inside a storage container on northern Haida Gwaii in April 2012. The owner proved to be a 29-year-old resident of Yamamoto who’d lost three family members to the tsunami. British Columbians have stumbled over boats, refrigerators, toys, tires, construction wood, and other miscellanea. Spotting wave-beaten ghost vessels drifting offshore is one thing, searching for the ocean’s minutia is another. The Canadian government has expanded an existing program that anchors floating square settling plates, made of polyvinyl chloride, at near-shore sites such as docks and marinas. The planktonic life-stage of tunicates, bryozoans, worms, mollusks, and other fouling invertebrates collect on the plates and are later analyzed for their potential to grow into bigger and scarier invasive critters. American states have followed suit. As I find out working with the dumpster crew, filtering out JTMD, or “Japanese tsunami marine debris,” from other ordinary debris washed ashore can be a crude process based in part on hunches. Some items carry obvious Japanese script or identifying marks, while others reveal themselves only after the clingy marine life is scraped away. We place aside smaller, heavily encrusted tires with rims suggestive of Japanese vehicles and reams of shattered plastic, a hint of the violence wrought by the event. I feel almost qualified to do the work after half an hour under Lewis’s tutelage. His experience walking these beaches since 2003 gives him a good sense of what debris looked like before the tsunami. “So many small-sized floating objects that are different than the usual,” he concludes. “But you’ll never really know for sure.” Long-range debris tends to come ashore with stormier weather in winter and spring, he’s discovered. Generally, debris with more surface area exposed to the winds also crossed the North Pacific faster. Chapman examines a large fishing float with Asian oysters and a calcareous worm, a plastic jerry can with mussels almost certainly from Asia, and a piece of polystyrene displaying multiple peck marks from seabirds. “They’re eating it,” he observes. All are put aside as tsunami debris. Not all non-native species are troublemakers. The Pacific oyster was deliberately introduced to British Columbia from Japan around 1912, eventually becoming a major source of commercial aquaculture and recreational harvesting, and almost no one minds that it doesn’t belong here. Last summer, marine biologist Sandra Lindstrom found a small patch of Pyropia seaweed while working out of the Hakai Institute on Calvert Island. It had never been documented in British Columbia before and may be linked to JTMD. The Pyropia group is not a fierce competitor in the ecosystem, though, and sushi lovers actually might like to eat it if it does become established. A foreign species is only deemed “invasive” if it poses a serious threat to the environment, economy, or human and animal health. The chances of that happening depend on the sheer number of individuals released into the environment—propagule pressure—and the suitability of habitat, including ocean temperature. Because the modern shoreline of Japan was densely populated and highly developed, the tsunami released a far greater amount and diversity of debris—some of it extremely sturdy and capable of surviving the worst oceanic storms—than would have occurred during past centuries. All the large, floating infrastructure, such as docks, have the potential to transport multitudes of those undesirable “propagules” to North American waters. The study of tsunami debris and the timing of its arrival has revealed other surprising complexities: scientists now realize that North Pacific currents are far more complex than many thought. The dock found at Agate Beach was one of four unleashed simultaneously by the tsunami. A second one turned up off the Hawaiian island of Molokai in September 2012, but US agencies reportedly lost the dock while bickering over who had responsibility for it. A third dock washed ashore on Washington’s Olympic Coast National Marine Sanctuary in December 2012, and no one knows the whereabouts of the last one. Chapman now views currents as a series of circulation cells that may catch debris for a period of time until a weather pattern moves it along to another cell—“like marbles going through a maze”—until the debris finally washes ashore. Researchers also originally thought that debris from the water—boats, docks, buoys, and the like—posed more of a risk for transporting alien species than debris originating on land because it was already covered with organisms. Now they doubt that theory. Three months after the tsunami, Japanese scientists released their first batch of floating transponders to better understand how winds and currents influence the dispersal of debris across the Pacific. The 12 transponders emulated “clean” land-based debris and hugged the Japanese shoreline for several months—which enabled marine life to become attached—before they floated across the North Pacific. Samuel Chan, another specialist in aquatic invasive species at Oregon State University, in Corvallis, shares his second-floor office with a 75-liter aquarium containing a comet goldfish capable of becoming invasive. Hanging nearby is a painting of a storm on the Oregon coast near Cape Perpetua reminiscent of Hokusai’s famous 1830s woodblock print, Under the Wave off Kanagawa—not a tsunami, the researcher is quick to point out. The soft-spoken Chan hauls out a mayonnaise-sized jar of glycerol-water solution containing the reproductive fruiting body of wakame kelp. 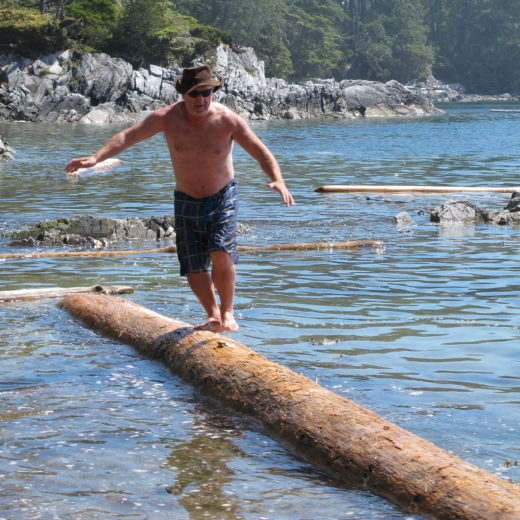 Native to Japan, the kelp formed a “hula skirt” around the dock that arrived at Agate Beach. It grows in thick patches and threatens to displace the more ecologically important native bull kelp if it takes off. Chan says the chances of foreign species becoming invasive are small but real—an estimated two to three percent for marine aquatics. That could still translate into half a dozen or more new tsunami-related invasive species taking hold along the North American Pacific coast. “It may take five years until we see colonies because the coastline is so complex and long,” he explains. They might be eradicated, though, if detected early enough. So far, the striped beakfish, also known as the barred knifejaw, is the only non-native species scientists know of that’s managed to swim away from the tsunami debris that carried it to North America. A saucer-sized juvenile with distinctive light and dark vertical stripes turned up inside a crab trap at Port Orford, Oregon, in February 2015. Over time, a beakfish can grow to 80 centimeters. Five beakfish were also found alive inside a six-meter Japanese skiff that washed up near Long Beach, Washington, in March 2013. Calcium rings on their ear bones showed that the fish were one and a half years old, suggesting they jumped aboard some months after the tsunami. DNA tests are pending to confirm that the jacks—streamlined silver fish with a yellow tail and vertical stripes—are from the western Pacific and distinct from the existing eastern Pacific population. With any luck, neither the jacks nor the beakfish, which have powerful beaks and a sweet tooth for shellfish, will become invasive. Chapman points out that both require waters 20 °C to spawn, which should reduce their chances of establishing north of approximately Santa Barbara, California. Researchers are relying on knowledgeable beachgoers like Lewis to keep watch for some of the other species that may prove invasive. The list includes dead man’s fingers, a branching green algae already growing in small isolated patches off areas such as San Francisco and Washington’s Willapa Bay; the light-purple northern Pacific sea star, which has become invasive in Australia; and the Asian shore crab, which could compete with native Dungeness and red rock crabs, among others. It takes all day for our team to separate the contents, weigh each, then toss them back into the dumpster. The work’s not as smelly as I imagined, though I cringe when I heave-ho on a load and a splash of God knows what hits me in the face. Chapman calculates we’ve sifted through 1,160 kilograms of beach debris—down to 934 kilograms once the mound of July 4th fireworks is removed. Of that amount, 136 kilograms, or 14.5 percent, is known or suspected to be from the tsunami. The items are carted away and measured, photographed, and scraped of material for Carlton’s lab. Living or recently dead samples go to the Smithsonian Environmental Research Center in Edgewater, Maryland, for genetic testing and to be searched for parasites. Unusual or educational pieces such as the pecked-out polystyrene may be used for displays; others end their fantastic oceanic journey in a dump. The results suggest that most beach debris is rather ordinary and not even associated with the tsunami. Still, tsunami debris bearing living Asian species is expected to continue arriving for several more years. Chapman believes that less than one percent of the roughly 1.5 million tonnes of debris estimated by the Japanese Ministry of Environment to have been set adrift has made it to North America. As work wraps up at the dumpster, Chapman admits that one type of debris in particular leaves him stumped. The Japanese estimated that timber from shoreline forests represented about 200,000 tonnes, or four percent, of the overall debris. So why have just three trees turned up in Oregon and Washington? The answer awaits somewhere out there in the fog and surf and the thousands of kilometers of remote coastline that do not easily reveal their secrets. Cite this Article: Larry Pynn “Strangers on the Shore,” Hakai Magazine, Oct 21, 2015, accessed April 23rd, 2019, https://www.hakaimagazine.com/features/strangers-shore/. In a Washington State lake, two of the most globally invasive crayfish species are duking it out. Should we step in?